By opus from houston tx. 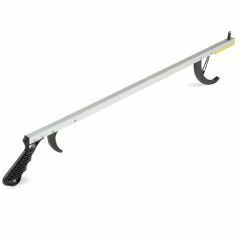 AllegroMedical.com presents The Norco Featherlite Reacher. This is one of our most popular reachers. The ergonomically designed handle allows items to be grasped with a firm, nonslip grip. This makes it very easy to pick up those not so easy to grab items. Pull clothing or blankets with the convenient lug, and lift small metal objects with the magnet. The claw teeth are interlocking with soft, molded tip grooves to really grip the objects. Pick one up to pick up things today! The ergonomically designed handle allows items to be grasped with a firm, nonslip grip. I am looking for a feather lite reacher like the Norco but, when in hosp, I noticed that it could not hold on to all items. Do you have the same one with the same features but a stronger grasp?